[마임 네임 이즈 얼] 내가 찜했다. Joy: EARL, your brother shaved the damn cat again. 얼, 자기 동생 저 망할 고양이 털 또 깎아 놨어. Earl: Randy hadn’t been inside Kenny’s parents’ house since we robbed it in high school. All we got was a back pack full of birds. 랜디는 고등학교 때 케니 부모님 집을 털고 난 후로는 그 집에 들어 간 적이 없었습니다. 가지고 나온 건 가방 가득 새만 담아 왔죠. Mrs James: So are you visiting all of Kenny’s classmates’ parents? 그래, 케니 같은 반 아이 부모님들은 다 찾아 갈 거니? 지금 연락이 안 되는 친구들만 요. 제가 반장으로서 동창회를 조직하는 게 제 임무죠. *I'm jammed all day but why don't you come up at 7? We'll have a drink and catch up on business. 하루 종일 사무실에서 꼼짝 못하고 있어. 하지만 자기라면 7시에 사무실로 올라와도 돼. 괜찮겠어? 한잔 하면서 밀린 비즈니스 얘기나 좀 하자고. Mrs James : Oh, isn’t that sweet? 오, 고마운 일이지 않아요? Mr James: Can I get you a beer, son? Randy: (looks outside, looks back) I would love a beer, Thank you. 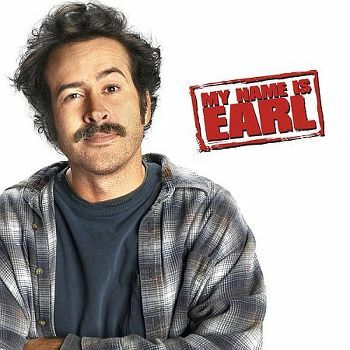 Earl: What are you doin? 뭐 하는 거야? Catalina: You don’t like me? 내가 싫어? Earl: No, no, you’re nice, it’s just Randy, when you came in to give us towels, he called dibs. 아니, 아니, 넌 근사해. 랜디때문이야. 네가 수건 주려고 들어 왔을 때, 랜디가 널 찜했거든. / have dibs on…에[할] 권리가 있다; I have dibs on that last piece of pie. FLASHBACK: Catalina entering motel room holding towels, walking past Randy and Earl on the bed. Randy staring at her. Randy: (hits Earl) Dibs. 내가 찜했다. Luckily, he got Kenny’s address before he pissed off Mr. James. 9캔이 마법의 숫자인 거 같습니다. 다행히도, 케니 아버지 열 받기 전에 케니 주소는 알아 냈습니다. *piss sb off: to make sb annoyed or bored /I blew my top. or I´m really getting pissed off. 나는 머리끝까지 화가 났다. Mrs James: I think I have Kenny’s yearbook in here somewhere. 케니 졸업앨범 여기 어딘가 둔 것 같구나. Randy: (hits Mr. James) Dibs. 아줌마 내가 찜했어요.